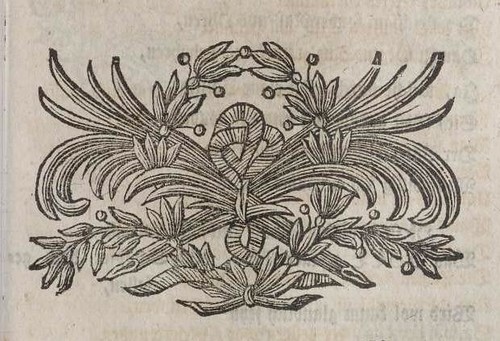 Printers' ornaments are decorative motifs used to fill in page space, signify the end of a chapter or the end of a book and generally add an aesthetic quality to the printed page. They have been around since moveable type printing commenced in the 15th century. 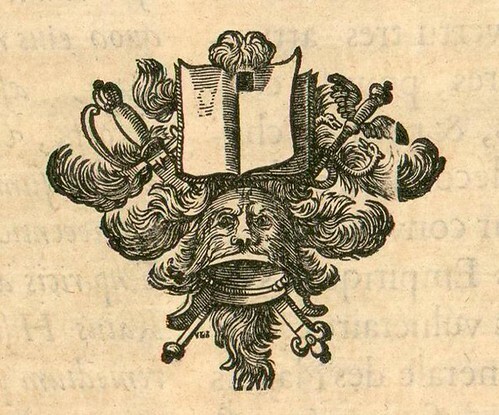 Other names associated with the practice -- "printers' ornaments" being something of a catchall title for a group of printed design elements -- include typographic fleurons, dingbats, headpieces, tailpieces, scrolls, trophies, lunettes, calligraphic and heraldic devices, cupids and wreathes. Adding embellishments to a page of writing really began of course with the monastic scribes illuminating manuscripts to make them more beautiful and therefore worthy of carrying a religious message. 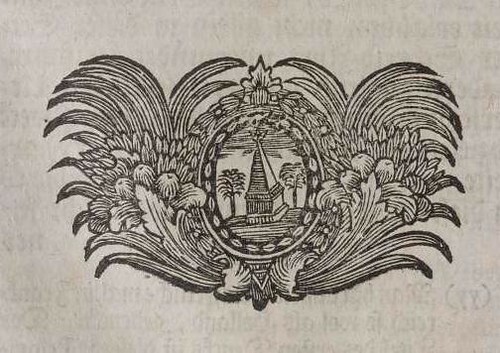 Woodcut artists had also provided decals and illustrations for manuscript adornment prior to Gutenberg, so the technology was already available before the first printing presses had been constructed. 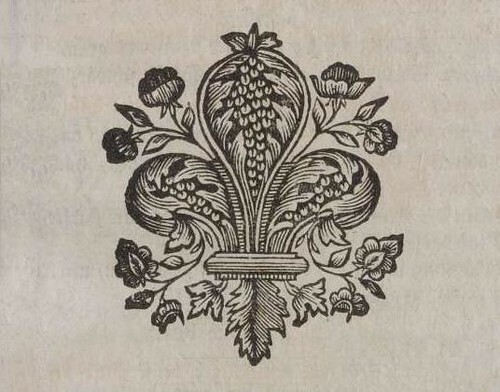 Scribes gave way to printers who carried on the tradition of page decoration and there was a move toward woodcut motif production that could be used within the technical constraints of moveable type printing. From my point of view this is where the story gets both interesting and a little fuzzy. 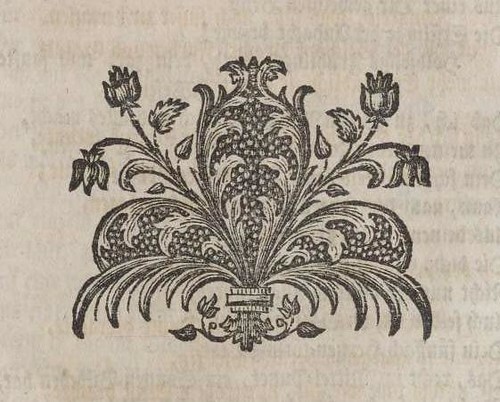 As I understand it*, there is a shortfall in our historical knowledge about the relationships between the printshops and the woodcut artists. 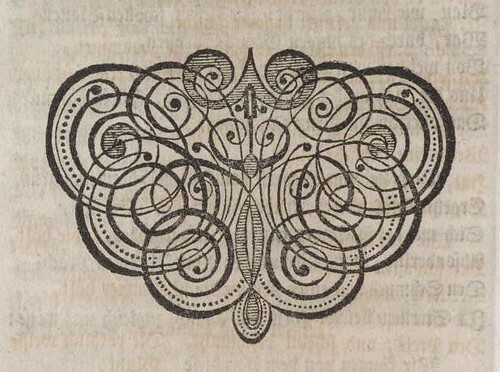 Whether individual printers employed the artists exclusively or whether they were more along the lines of freelance employees has a significant bearing on the the way the woodcut designs of printers' ornaments were circulated throughout Europe and which designs belonged to specific printshops or particular regions and countries. 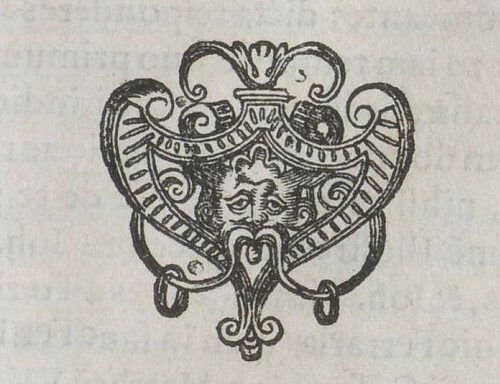 Although it's only a single datapoint, I did read in passing of one Hungarian woodcut artist who designed his ornamental woodblocks himself and sold them to printshops nearby and also to foreign printers. 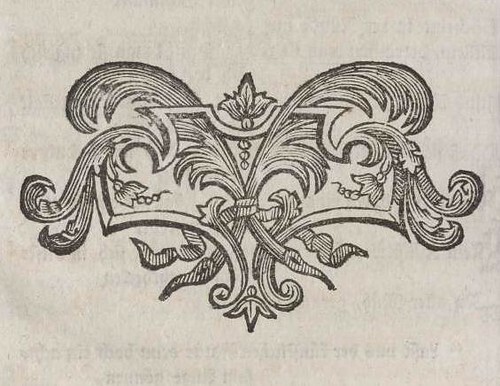 I find this dissemination angle interesting in the same way that the circulation through Europe of the tenets of the Renaissance (of which, I suppose, moveable type woodcut ornaments were part) was interesting and had a resonance in the way societies in different locations developed. *Be assured I am no authority whatsoever and there are without doubt books and papers among the scholarship that I haven't seen that are able to elaborate on this aspect with greater certainty. 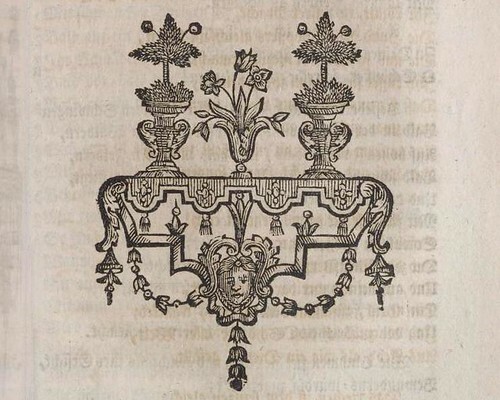 For about the last year I have been lazily collecting examples of printers' ornaments that I came across as I was scanning through truckloads of digitised books without any great plan in mind. If you click through on any of the images above it will take you to a collection of more than eighty cropped and background-cleaned designs that I've saved. They are mostly from German books (most are from HAB), but perhaps twenty percent were from French, Spanish, Porgtuguese and English books if memory serves. They range in date from about 1590 to 1750, most being from around 1700. 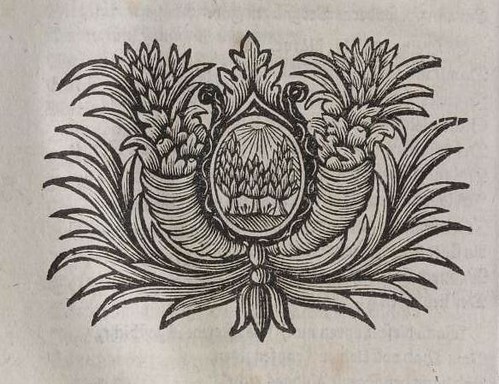 If anyone is particularly interested as to the origin of any in the set, they can drop me a line in the next fortnight and I can probably identify the specific book from which most ornaments derived. After that I'll be deleting the series from my hard drive. The one author whose books contributed the largest number of ornaments is Barthold Heinrich Brockes* (~1730-1740), just by the by. 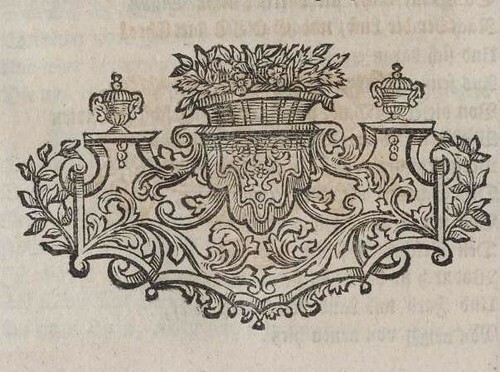 I presume that the woodblocks with ornaments got used a lot and worn away accounting for the shabby print quality often seen - I collected about two hundred of them all told and edited out the worst. Passe-Partout International Bank of Printers' Ornaments at Bibliothèque Cantonale et Universitaire - Lausanne. 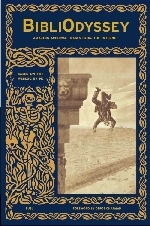 Projet Moriâne at Université de Liège. 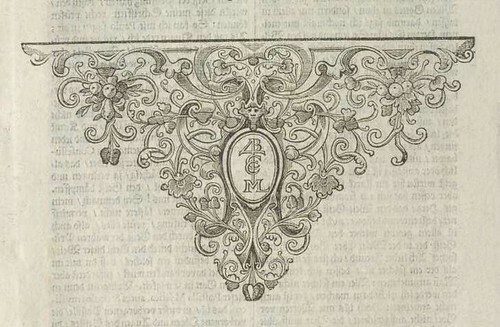 Ornements Typographiques Réunis de Pierre Mouriau de Meulenacker. Some links (although there doesn't seem to be too much specific on this topic on the web).. Flowers from the Printer' Gardens [pdf] - just an announcement of a lecture last year by Dr Ethan Lipton. The internet archive turns up three books - that middle one is pretty good from an advertising design perspective. I didn't look at the other two. 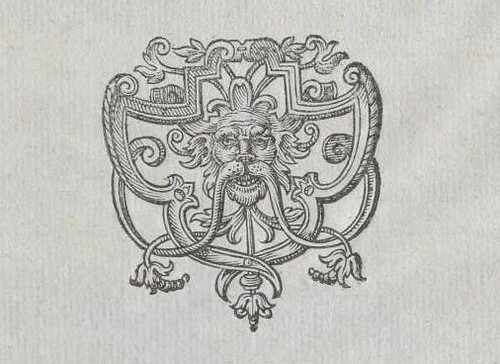 'Pictorial Archive of Printer's Ornaments: from the Renaissance to the 20th Century' edited by Carol Belanger Grafton (1980) contains nearly fifteen hundred design examples. 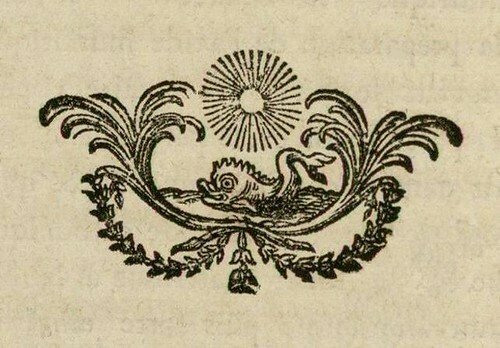 Previously: The Printer's Device; Dictionary Iconography. Nice collection. I was thinking I might have time to do another look in JSTOR next week (after this week's gamelan extravaganza) if you're still hunting info. Taa. Oh if you happen to stumble into something of worth, sure. But I guess I kind of took a big breath and just threw it all up 'as is', so to speak without going overboard into the background. It was time to get rid of the thing off my brain and desktop. I continually feel like an air traffic controller with all these images and ideas circling around in a holding pattern. This one ran out of fuel. I'm also waiting for Ethan (mentioned in a link above) to pass on a paper he's writing. I guess if further material floats into my airspace and the winds take me, I'll revisit this topic sometime. Thank you for these images. Some syzygial archetypal quality about several of them that can't be expressed. My favorite is the eleventh one (sixth from bottom). Would like to know where that one is from if you still have the info just in case I can use it in my upcoming research on chiasmus. By the way did your niece's delivery go well? If she needs any consolation during the early months of motherhood, let me put her in touch with Stephie. JP, since posting this entry I did go and add citations for half or more in the flickr notes. Mother and child are well and happy thanks v. much. Both will be house guests for a week very soon. That's either something to fear or a stretch of bliss on offer. I will endeavour to put 'syzygial' in a sentence every day this week. These ornaments demonstrate an interesting artistic contradiction. On the one hand the ornament designers show tremendous imagination and ingenuity in they way they create seemingly endless variations on their chosen themes/motifs. On the other hand, one can only wonder why the range of motifs is so narrow in the first place. Oftentimes great creativity stems from limitation. Although I don't disagree with anything you've written Saul, I should point out that the examples here as well as the collection posted to flickr aren't really intended to be an overview or survey of the genre. It's a narrow sampling is all, skewed by my feedreader stream and my tastes. This is such an interesting post! Thanks for posting these up. 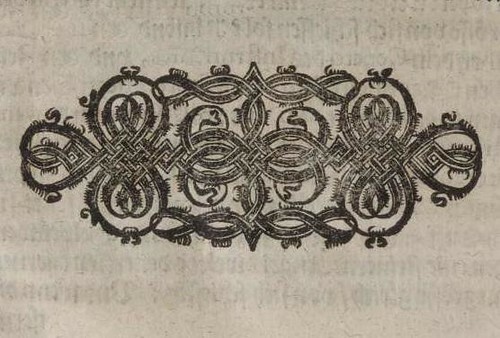 I've always wondered about those ornaments whenever I read a book that has it printed in them. "Wow these are gorgeous! Especially the first one which is beyond beautifully gorgeous. Thanks for sharing this i think its great!